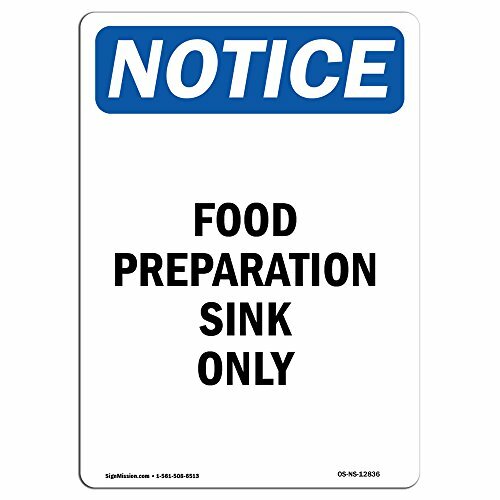 OSHA Notice Sign - Food Preparation Sink Only | Choose from: Aluminum, Rigid Plastic or Vinyl Label Decal | Protect Your Business, Construction Site, Warehouse & Shop Area | Made in The USA by SignMission at Wakaf Center. MPN: OS-NS-A-1824-V-12836. Hurry! Limited time offer. Offer valid only while supplies last. Make Sure You & Your Business are OSHA & ANSI Compliant.Is your business or work space 100% covered and up to code with current signage and labels? SIZE & SPECS: 24" X 18" Aluminum (Rust Free) - Commercial grade pre-finished white aluminum with (4) pre-drilled ¼" mounting holes and rounded corners.